Join the Georgetown University Library on Wednesday, April 3 from 4-6 pm in the Arrupe Hall MPR for a special book talk with Associate Professor of Computer Science, Cal Newport. Newport will discuss his newest book Digital Minimalism, which argues that we have been too casual in adopting alluring new technologies, and as a result our quality of life is diminishing. 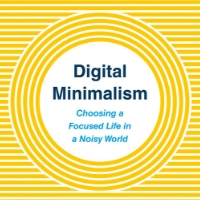 Digital Minimalism is an indispensable guide for anyone seeking to cultivate a focused life in an increasingly noisy world. In addition to researching cutting­ edge technology, Newport also writes about the impact of these innovations on society. Newport is the author of six books, including the forthcoming Digital Minimalism, which argues that we should be much more selective about the technologies we adopt in our personal lives, and the bestseller Deep Work, which argues that focus is the new I.Q. in the modern workplace. Newport’s writing and ideas have been featured in the New York Times,NPR, the Wall Street Journal, the Economist, and the New Yorker. Questions? Email Emily Minton, program and events coordinator, Georgetown University Library.